Twin tricksters Kane & Abel perform magic and comedy inspired by clichés surrounding twins. 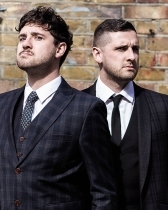 Every question the identical twin brothers have been asked during their life – whether they are harmless, hurtful or just hilarious – have been developed into the narrative of this fun-filled and "seriously impressive" (BBC Radio Bristol) show. They'll prove they know what each other is thinking and feeling and whether they've ever used their similarities to steal each other's girlfriends. Split Egg: a magic show about being twins was nominated for 'Best Free Show' at the Edinburgh Fringe Festival 2018.